Officials say subsidy foremployees and students a benefit to all parties. University of Utah students and employees can likely count on a free transit pass for the next decade thanks to a deal reached between U. officials and the Utah Transit Authority. After 16 years of renegotiating annually, the new deal would extend the long-standing relationship between two state entities for a 10-year period. The university would pay an annual flat sum  $3.7 million this year  with a preset schedule of increases. The deal, which still requires U. trustees approval, allows the university to better manage its transportation program, which is vital to many of its campus-planning goals, and the student fees that support it. "To get an increase [in student fees], we have a lot of hoops to jump through, and people always worry about it. Is it going to be there next year?" said Alma Allred, director of commuter services. The deal is also a winner for UTA, which can continue counting on the 6,000 U. riders who board its buses and light-rail trains every weekday. "UTA and the U. have been close partners since before the first TRAX line was put in [in 2000-01]," said agency spokesman Gerald Carpenter. "It's a mutually beneficial relationship. Each year we introduce a new generation of users to public transportation." The agreement signals UTA's willingness to continue supporting discounted passes for educational communities, even as the agency explores moving to a distance-based fare structure. Trustees are considering the 10-year contract at their regular meeting Tuesday. Under the plan, the U. 's annual payment would increase 5 percent each of the next six years, followed by annual 4 percent increases. Either side can back out of the deal if its terms become financially impractical. Carpenter noted that UTA is required by statute to collect reasonable fares. Whether or not they ever step foot on a train or bus, every U. student and employee can have a UTA pass without spending a dime. To help fund the so-called Education Pass program, however, full-time students pay an additional $84 in annual student fees. Were they to buy a transit pass, it would cost $58.75 a month. Non-students, such as professors, would pay $78.50. The U. 's 3.1 million riders last year accounted for about 8 percent of UTA ridership. 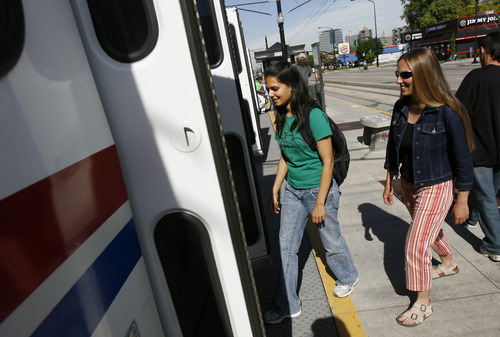 Public transit is an important component of the Wasatch Front's other institutions of higher learning, although they have much different arrangements with UTA. And U. ridership eclipses that of all the other schools combined. Students at Brigham Young University and Salt Lake Community College may buy modestly discounted transit passes, while Weber State and Utah Valley universities are in the second year of three-year contracts that charge the schools based on their students' actual ridership. While transit-riding students and faculty are the big winners in the U.-UTA relationship, subsidized ridership also benefits taxpayers, drivers who enjoy less crowded roads, and everyone who breathes Wasatch Front air, officials say. About one-third of the 42,000 U. 's faculty, staff and students regularly accessed campus last year by public transit. That's good news for U. officials who are intent on reducing the university's "carbon footprint," freeing up parking lots for other uses as more buildings go up, and making campus a more pedestrian-friendly environment. "Every person who rides UTA to campus [as opposed to driving] is the equivalent of one pound of pollution that stays out of the air," Allred said. Those riders are also reducing pressure on the U. 's increasingly crimped parking lots, which now have less than 1,000 available stalls on any given day. "It costs a lot less to put people on the bus than to build another parking structure. We don't have a lot of places left to put down asphalt," Allred said. "It doesn't make sense to spend $15,000 to $20,000 per space to build a parking garage." Those who brave Foothill Drive during rush hour may disagree, but the Utah Department of Transportation has documented an easing of traffic on that arterial street, as well as 500 South and 1300 East, in recent years. "Following the introduction of TRAX service, congestion near the university fell to levels not seen since the 1980s, even as the number of students, faculty and staff at the university has increased," wrote U. planning professor Reid Ewing in a successful research grant proposal. Is this a happy coincidence, or should public transportation be given the credit? "The benefits to the community are less obvious but equally real  less congestion on roads leading to the U such as 4th South, less noise and air pollution, fewer accidents, and the potential to develop 4th South as a walkable transit corridor," Ewing wrote in an e-mail. "Our study will estimate the magnitude of these benefits, and be able to compare them to the costs of the public subsidy."